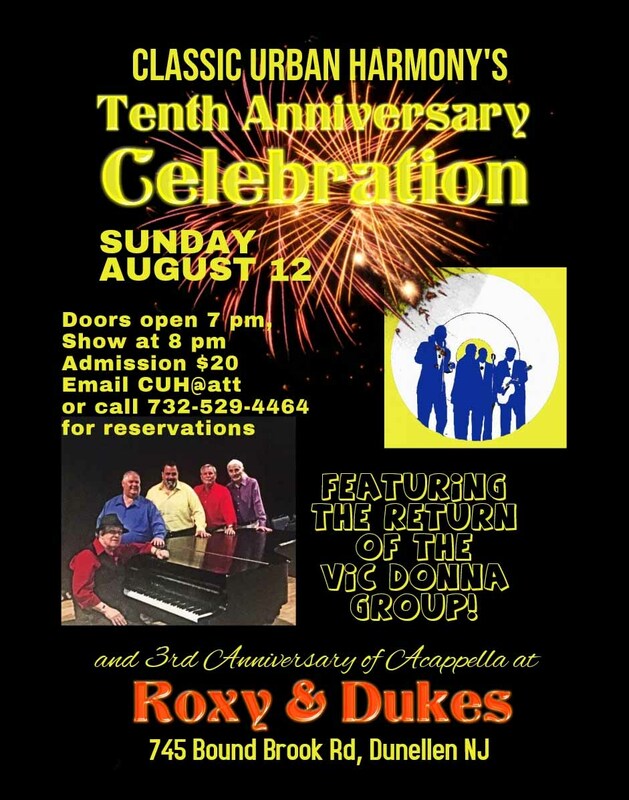 Classic Urban Harmony LLC marks its 10th Anniversary with a big celebration at Roxy & Dukes, 745 Bound Brook Rd, Dunellen NJ on Sunday night, Aug 12. Featured that night is the return of the great acappella group THE VIC DONNA GROUP. Vic Donna’s been giving us great R&B and Doo Wop harmony since the 1950’s. Learn about his career in our article, The Vic Donna Story. The Vic Donna Group has recently taken some time off to undergo some personnel changes, but they are now back as great as ever. Catch them in their first full performance (two sets) in quite a while. There’ll be door prizes and give-a-ways. This is also our 3rd Anniversary of acappella doo wop at Roxy & Dukes so you know it will be one big party.